I know that this place has been awfully quiet lately and that it probably seems dead… Well, it isn’t. A lot of things are happening right now and I really need the time away from the kitchen, but I miss my projects and plan to revive my baking as soon as possible. But right now I just couldn’t resist this month’s Daring Bakers challenge. I had Esterhazy Cake on my To Do list for ages and when I saw the task, I knew that its time has finally arrived. 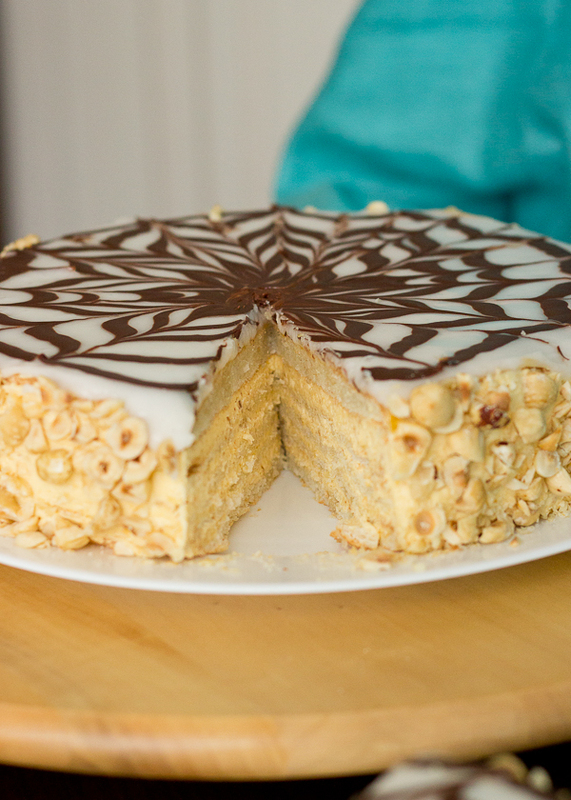 So while I am struggling with life, enjoy this amazing Esterhazy Cake, it is worth the time and effort. See you soon! 1. Preheat your oven to 170°C/ 350°F. 2. Prepare 5 circles from baking paper, each 23 cm wide. 3. In a large stainless steel bowl start beating the egg whites and the pinch of salt, with your mixer on high speed. When the egg whites become foamy, gradually start adding the sugar. Add the vanilla extract. Beat until stiff peaks form. 4. Sift together the almond and all purpose flour. Add the dry ingredients to the egg whites in 3 additions, gently folding the flours into the meringue every time. Try not to deflate the egg whites, and mix until no dry spots appear. 5. Divide the batter between the prepared circles. Gently transfer the circles one by one to a baking tray and bake for approximately 15 minutes, or until the surface of the cake feels dry to the touch and is lightly golden in color. Let the layers cool completely before peeling the paper. Use a cold baking tray for every layer. 1. Start by toasting the hazelnuts in a moderate oven for 10 minutes. Let cool completely and divide in two equal parts. Chop coarsely 100 gr. and set aside to use in the assembly of the cake. The remaining 100 gr. grind as finely as possible, pulsing in the food processor. 2. Place the egg yolks, sugar and vanilla extract in a large bowl and place over a pot of simmering water. Whisk constantly for 10 minutes, at this point the sugar must be completely dissolved and the mixture should be pale. Remove from the heat and start beating with your electric mixer, at high speed until the bowl is no longer warm to the touch, and the egg yolks have doubled in volume. 3. Lower down the speed and start adding the butter, a few tablespoons at a time. Mix until fully incorporated. 4. 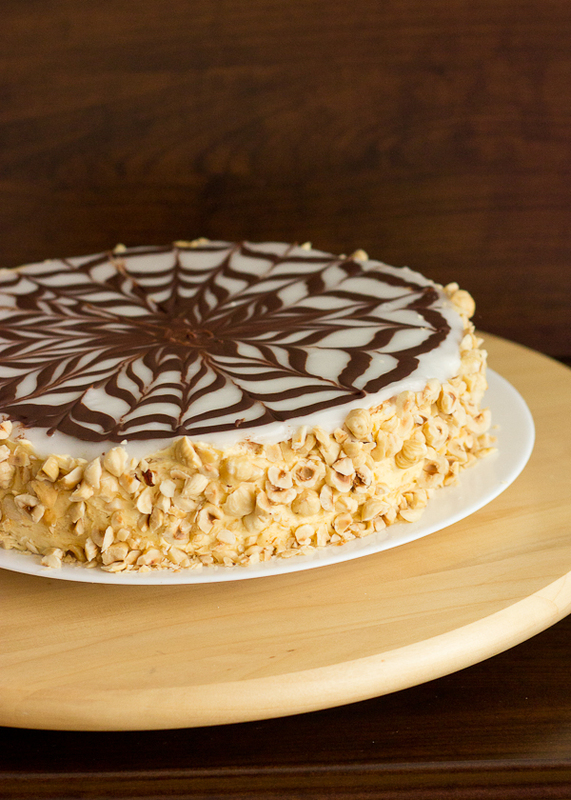 Gently fold the ground hazelnuts into the cream using a silicone spatula. 1. 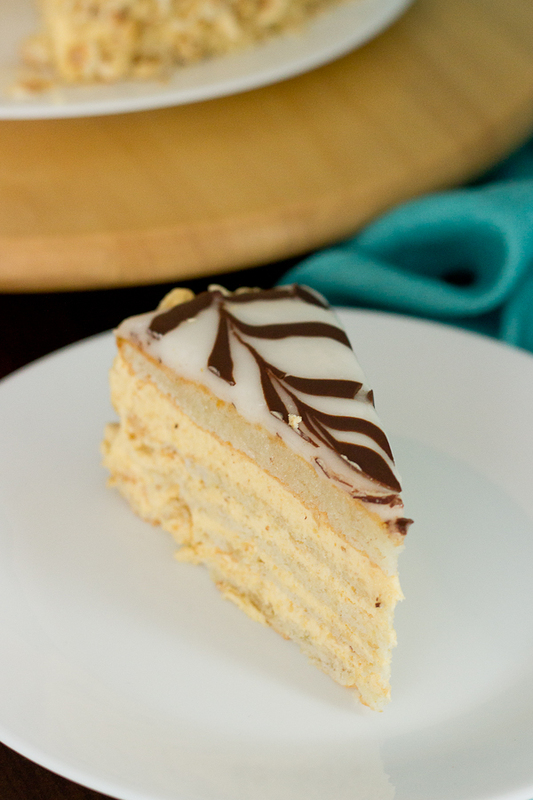 Start by assembling the prepared cake layers and cream. I recommend using a 23 cm. cake ring or spring-form pan for this. 2. Place the first cake layer into the bottom of the ring. Set aside 2 tablespoons from the cream and divide the rest in equal parts. Spread one portion of the cream over the first layer and cover with the next layer, spread a portion of the cream. Repeat with the remaining layers and cream, leaving the last layer dry. Cover the cake with aluminum or plastic foil and press it, using a heavy object, like pot full of water to level it. Let sit in the fridge for one hour. 3. Heat the apricot preserve and water and stir it until smooth. Remove the pot and the foil from the cake and brush the surface with the apricot glaze. Let chill for 30 minutes. 4. Prepare the icing. In a bowl mix the powder sugar, lemon juice, oil and hot water and stir until smooth. The glaze must be thick yet pourable. Melt the dark chocolate together with 1 teaspoon of oil and place it in a zip lock bag. 5. Pour the sugar glaze evenly over the cake. Cut a small piece of the corner of the zip lock bag and draw a spiral with the chocolate over the white glaze, starting from the center. Using a toothpick draw lines to and from the center of the cake. 6. Let the glaze chill and dry in the refrigerator for minimum two hours. 7. 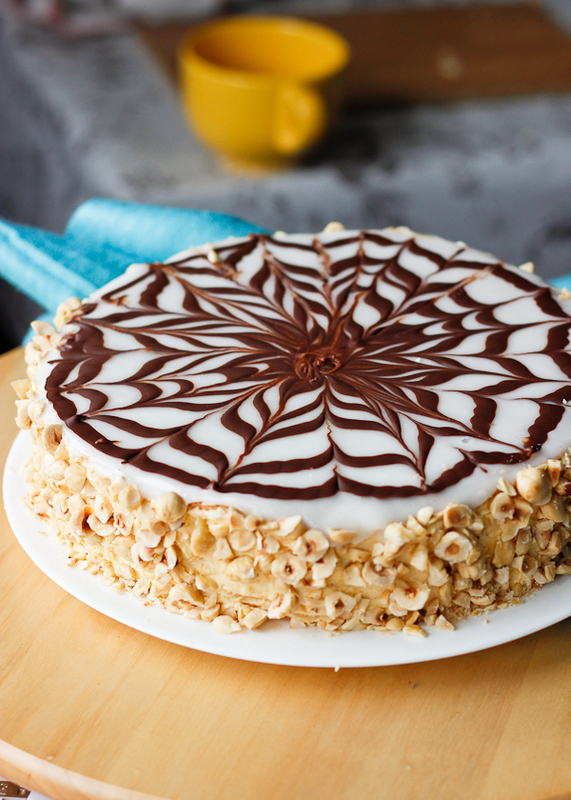 Remove the cake from the form and carefully spread the reserved hazelnut cream onto the sides, then decorate the sides with the reserved hazelnuts. It looks gorgeous! Thank you so much for finding a time to participate! Your web is amazing! I am in awe of all the wonderful webs…I struggled with that! Yes, I can understand how though we love our blogs it is hard in the real world to keep up…me too!